We are manufacture of utensils, handicraft aluminum naksheen ( meenakari ) thal also known as patashe wali thali, baskets, trays, metal boxes, pooja thal, bowls used in packing dry fruits, sweets, chocolates, gifts, etc. With great conceit, we set up ourselves as the foremost entity, dedicated towards offering excellent quality Aluminium Glass. It is used to provide excellent look to the interiors of the buildings. The provided product is processed using premium quality basic material and modern processing techniques at our manufacturing unit. Filled with red color enamel, 5" in dia and 7. 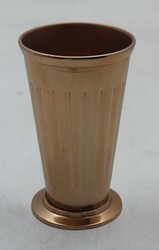 5" high, aluminum julep cup. 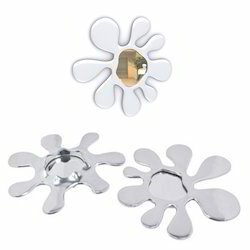 Also available in shiny polished aluminium without enamel. Relying on our expertise in this domain, we are into offering Aluminum Fabrication Glass. Our organization is passionately engaged in offering an exclusive array of Aluminium Tuffen Glass to the customers. These products are made from high quality components. We are engaged in offering good quality Aluminum Glasses to our customer.